The Newcastle director of rugby has guided the club into the Premiership playoffs for the first time this season. 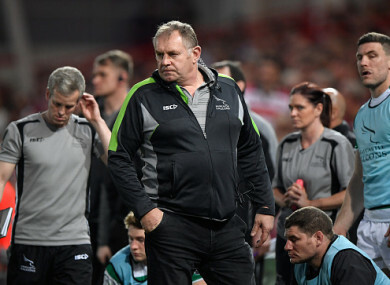 DIRECTOR OF RUGBY Dean Richards has signed a new three-year deal with Newcastle Falcons after guiding them into the Premiership playoffs for the first time. Richards has worked wonders at Kingston Park this season, masterminding a top-four finish and steering the Falcons to the semi-finals of the Challenge Cup and Anglo-Welsh Cup. The former England forward has spent six years at the north-east club and has agreed to extend his stay. Newcastle host Wasps in the final match of the regular season on Saturday knowing a victory would move them above their opponents and into third spot, setting up a showdown with Saracens. Defending champions Exeter Chiefs will be their opponents if they fail to get the better of Dai Young’s men. Email “Big boost for high-flying Falcons as Dean Richards signs new three-year deal”. Feedback on “Big boost for high-flying Falcons as Dean Richards signs new three-year deal”.